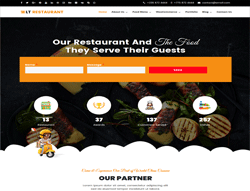 LT Restaurant is a free and premium WordPress theme highly recommended for food order or restaurant websites. The theme comes with a clean and eye-catching design, which makes it easy to showcase and update your important information about your restaurants food. In addition, we integrated payment methods that help customers easily buy your products for delivery through online ordering systems. LT Restaurant supports fully responsive layouts to ensure your website looks great on any screen size, plus it comes with lots of really useful built-in features such as shortcodes, drag-drop layout content, Bootstrap CSS & Hybrid framework to help you easily customize the design. Especially, it comes with unlimited color and a color picker in the admin panel to create wonderful websites with various layouts.